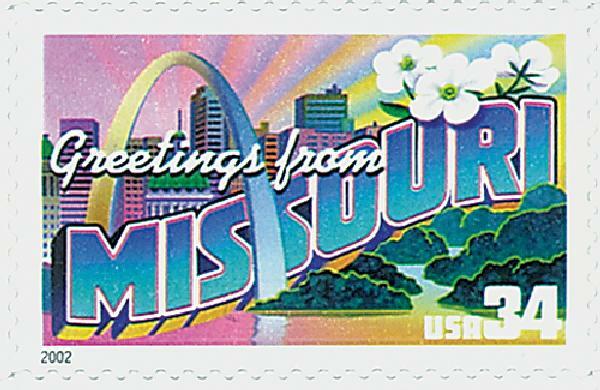 U.S. #3585 – Gateway Arch, Tallest Monument. On June 10, 1967, the Gateway Arch opened in St. Louis, Missouri. In 1933, St. Louis civic leader Luther Ely Smith returned from a visit to the George Rogers National Historical Park in Indiana. He believed a similar memorial could be built in St. Louis to help revive the city’s riverfront and improve the economy. He presented the idea to the mayor, who in turn shared it with city leaders. 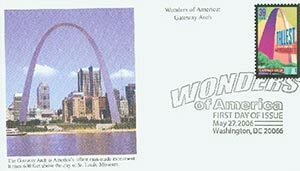 U.S. #4044 – Gateway Arch, Tallest Monument First Day Cover. The association believed the monument would cost about $30 million and asked the government for three-quarters of the money ($22.5 million). While many locals didn’t like the idea of using public funds for the memorial, it was expected to create 5,000 jobs for three or four years, which would help the Depression-era economy. After several months of negotiations within the government, President Franklin Roosevelt signed the bill approving the monument on June 15, 1934. 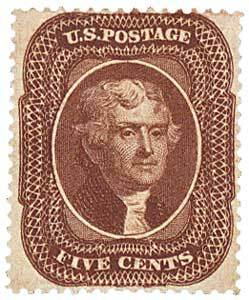 U.S. #28 – The Arch was built in part to honor Thomas Jefferson for the Louisiana Purchase. The following year, the memorial received funding from two New Deal Agencies – the Public Works Administration and the Works Progress Administration. Additionally, the National Park Service signed on to manage the memorial. In December 1935, President Roosevelt signed an executive order approving the memorial and its 82-acre area as the first National Historic Site. In the following years, they acquired the land and demolished old buildings. All the while they faced opposition, but the project continued. 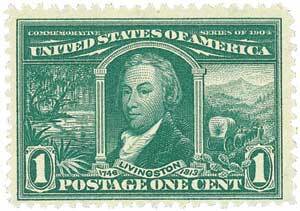 U.S. #323 – The monument paid tribute to Robert R. Livingston, who helped negotiate the Louisiana Purchase. The project was slowed for several years because a railroad passed too close to the monument, and it had to be moved. But ground was finally broken in 1959, and construction on the arch began on February 12, 1963. Though they hoped to have the arch completed for the St. Louis bicentennial in the fall of 1964, the project was repeatedly stalled due to safety checks, funding issues, and legal disputes. Construction finally finished on October 28, 1965. A time capsule with the signatures of 762,000 students was placed in the keystone before it was set. And as the arch was completed, Vice President Hubert Humphrey watched from a helicopter. 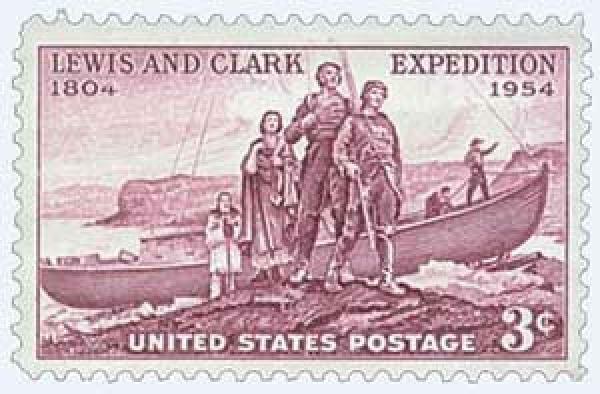 U.S. #1063 – The monument was also constructed to honor Lewis and Clark for their expedition of the West. The Gateway Arch officially opened to the public on June 10, 1967. The dedication ceremony was held the following May 25, with Humphrey again present. He claimed the arch was “a soaring curve in the sky that links the rich heritage of yesterday with the richer future of tomorrow.” The arch cost much less than initial projections, just $15 million. And while it only required about 100 workers, it revitalized the riverfront, creating more lasting jobs at a new sports stadium, hotel, parking garages, and apartment complex. Item #CNMO25D – The Missouri State Quarter featured the arch. The Arch has foundations set 60 feet into the ground, and is built to withstand earthquakes and high winds. Each leg is an equal-sided triangle with 54-foot sides at ground level, tapering to 17 feet at the top. The legs have double walls of steel three feet apart at the ground and closer higher up. A forty-passenger tram made up of eight 5-passenger capsules operates in both legs. The trams were built on a combination of the principles of the elevator and the Ferris wheel. The ride to the top takes four minutes. At 630 feet high, the Arch is 75 feet taller than the Washington Monument and more than twice as tall as the Statue of Liberty. Click here to view photos from the construction. This entry was posted in June 2016, This Day in History. Bookmark the permalink. 7 Responses to "This Day in History… June 10, 1967"
I saw the arch when it was about half way completed and then again I went through it shortly after its finalization. It is a grand testimony of what man can do when teamwork is involved. When I watched the History Channel about under construction The Gateway Arch last few years ago and It was very interesting also under construction of old St. Louis Cardinals Baseball Park that 1967 Red Sox were played their road game during the 1967 World Series until 2004 World Series Red Sox won their 6th World Series at old St. Louis Cardinal Baseball Park before it torn down on 2006. I transferred from Maine to California in Jan of 65 on old rte 66. I don’t remember seeing the arch in construction but had the change to travel through St. Louis again in the last 70’s. I took the trip to the top. The tram was confining but an interesting ride. The windows at the top looking down created an awesome view but the gentle sway of the arch at 630 feet about the ground was quite an experience. I made my first visit to the Arch in 1971 with my parents and brother, second visit with my wife in 1984, and third visit in 1996 with our children! Looks like visit four is long overdue! Thanks for sharing! Es un gran testimonio de lo que el hombre puede hacer y realizar a travez de su historia.Felicitaciones. I was very little when I first visited the arch and looking up at it from the ground it scared the crap out of me and I did not want anything to do with it. Once on top (after almost being dragged along) I was so impressed that I did not want to leave.